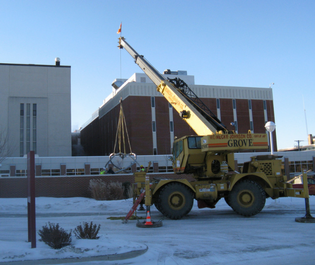 As MeritCare, a Fargo-based health system, wrapped up its centennial celebration, hospital leadership envisioned creating something more permanent to acknowledge the milestone. They wanted something that would carry its theme “Lighting the Way” into the next century: an outdoor sculpture of a flame to be located in the hospital’s healing garden. (Note: MeritCare is now Sanford Health). 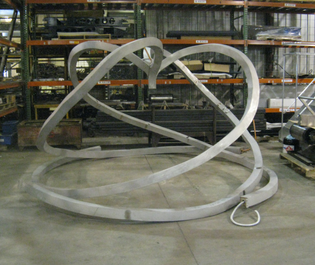 Reach Partners was asked to manage the sculpture’s design, approval, production and installation. Complicating the project was its timeline (four months) and the season (winter). An artist was contacted and provided a few sketches that were reviewed by the leadership team. After considering the sketches, the team asked that an actual flame be incorporated into the sculpture. That simple request added layers of complexity to the project. Fortunately, a partner from the MeritCare marketing time envisioned how to design the sculpture in a way that allowed for a lit flame. As Reach Partners managed the process, we recognized that there were numerous questions that need to be addressed. For example, could the hospital legally host a gas-operated, open flame within city limits? And how would the MeritCare facilities team safely pipe natural gas to the sculpture site. “A lot of this project was about asking really good questions,” Anita says. Once it was determined that a gas line could be run from the main hospital to its healing garden, Reach Partners turned its attentions to the actual construction of a flame. Since the sculpture was located in a city where the prairie winds seldom stop, Reach Partners wanted to ensure the flame would never blow out. Through research, they found a Georgia company that built small engines designed to relight the flame. 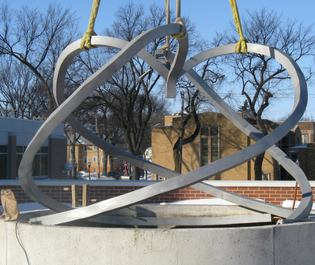 With this tool in place, Reach Partners collaborated with Standard Industries in Fargo to construct the metal sculpture. Then they coordinated installation of the public sculpture, which involved hiring a crane and arranging for road closures on the day of placement. Finally, Reach Partners organized the lighting ceremony held in late February — from invitations to organizing the program. The flame remains lit today, a testament of strong mission.